Me to You Online £5 Gift Card : Me to You Bears Online Store. Give someone the gift of choice with a Me to You Online Gift Card. This credit card sized gift card is much more convenient than gift vouchers plus, with thousands of Me to You items to choose from, the recipient will be spoilt for choice! 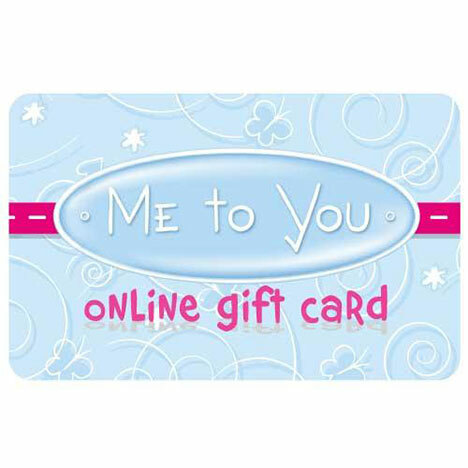 This gift card can be redeemed and used for items or services at www.metoyouonline.com. (Subject to website terms and conditions). Gift cards cannot be exchanged or returned for cash or credit except where required by law. Gift cards are valid for 24 months from date of purchase. Any remaining balance will be cancelled on expiry of the validity period. Your balance can be checked online or by contacting the website sales team. Me to You Online will not accept liability for lost, stolen or damaged cards. Me to YouOnline reserves the right to amend the terms and conditions of gift cards at any time andto take appropriate action, including the cancellation of the card, if, in its discretion, it deems such action necessary.